Meeting ewe nutritional requirements is critical in avoiding common lambing problems and ensuring increased survival rates of both lambs and ewes. The majority of foetal lamb growth occurs approximately 50 days prior to birth, with two thirds of the weight of the foetus occurring in the last six weeks of pregnancy. Strategic management is essential at this critical point in the ewe’s pregnancy. This includes strategies such as supplementary feeding of twinning ewes in a poor season or minimising feed intake of single bearing ewes in good seasons to avoid lambing problems. 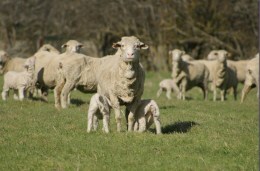 Ewe condition in late pregnancy can influence ewe and lamb survival rates. Condition scoring is a key indicator of adequate nutritional management of ewes, with a target condition score 3 being ideal in late pregnancy to maximise lamb survival. Singles in a tough year can be allowed to drop to condition score 2.5. Ewes carrying twin or multiple lambs are more vulnerable to poor nutrition as their demand for nutrition and energy to support multiple foetuses is high. Single bearing ewes in late pregnancy require 11.5 MJ/ME/hd/day and a diet containing 10% crude protein (CP). The energy requirement is 15% higher for twin bearing ewes. Hay or average quality lucerne hay is often not a suitable supplement due to its ‘bulky nature’ and the ewes reduced capacity of the rumen. Hay needs to be supplemented with other high quality feed in the diet such as grain especially if an autumn break has not occurred and there is no good green pick available. The amount and type of supplement is determined by the pasture that is available. Targets for pasture based on Food On Offer (FOO) for twin bearing ewes is a minimum of 1200 kg green DM/ha per hectare and singles is 1000 kg green DM/ha. It is important to meet ewe requirements in late pregnancy but not to over feed in late pregnancy as this can result in excessive lamb growth and lambing difficulties. Therefore it is important to mange ewe condition throughout pregnancy and do not allow ewes to become too thin. The ability of the ewe in late pregnancy to meet her nutritional requirements is a challenge for her due to reduced rumen capacity with the developing foetus. During this time the ewe is also at most risk of metabolic disorders such as pregnancy toxaemia. Under nutrition of the ewe in late pregnancy will result in low lamb birth weights and premature lambs both of which have significant lower survival rates. Reduced colostrum quality and milk production will result if ewes are underfed particularly in the last month of pregnancy and ewes will tend to desert at least one of their lambs if they are multiple bearing. Multiple and single bearing ewes should be managed differently as they have different nutritional and energy requirements. Meeting ewe nutritional requirements will result in better lamb and ewe survival and a decrease in lambing problems.